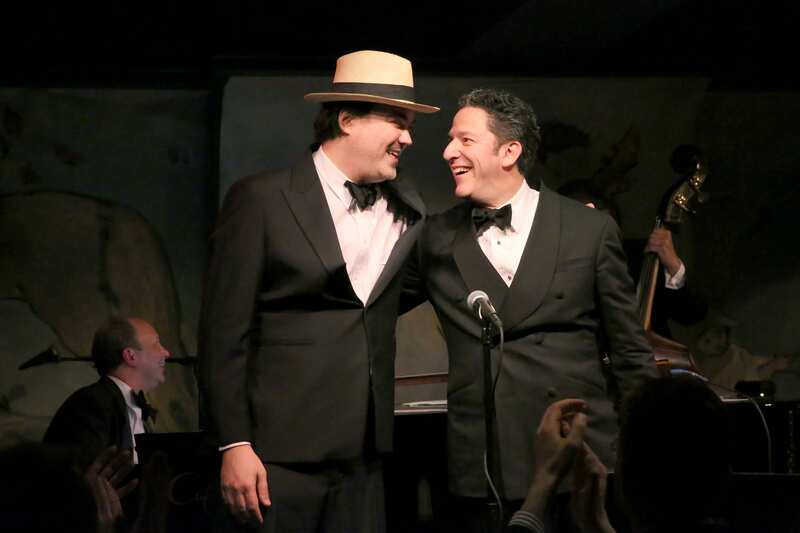 John Pizzarelli and Daniel Jobim, Bossa Nova II, Cafe Carlyle; photo by Mireya Acierto. John Pizzarelli, Bossa Nova II, Cafe Carlyle; photo by Mireya Acierto. 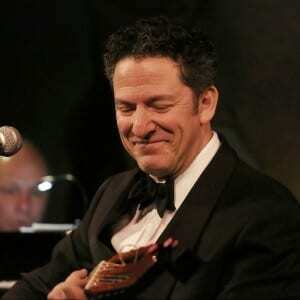 John Pizzarelli believes that life should be easy. And he works damn hard to make it that way. “Tonight we are the flying Wallenda’s of Jazz,” he whispers to no one on the way to the stage. He is gracious, accommodating and talented. Walking on water is coming any minute. He even announces himself when he is performing at the Café Carlyle because, hey, isn’t that the easiest way to start a show? Of course. And easy is the way you want it when Pizzarelli is sharing the stage with Daniel Jobim (yeah THAT Jobim) for Strictly Bossa Nova II now in residence at the Carlyle through May 2. They are in the company of equally fine musicians: Martin Pizzarelli on Bass, Daduka Dafonseca (say that three times fast), whose given name is Eduardo, but this nickname is so much better, on Drums, and Helio Alves on Piano. After treating us to ‘S Wonderful by that famous bossa nova duo George and Ira Gershwin, they launch into a tribute to Joao Gilberto and his album Amoroso/Brasil – an album that pulled Pizzarelli into the world of Bossa Nova years ago. “Musical Viagra” is what he calls it. They give us two familiar melodies – Tin Tin for Tin Tin (Carefully) and Besame Mucho (Heartbreak – you don’t have to know what it means to understand it). Jobim takes over the piano and absentmindedly doodles chords from his grandfather’s work while talking to Pizzarelli. Next up is the enchanting Two Kites in the original English penned by Jobim. There is always, always, always at least one song in every Pizzarelli performance that slays me – just puts me out flat – and this evening the first one was How Insensitive made famous here by Fran Sinatra. A song of perfect melancholy that makes a direct hit on anyone with a heart beat. Pizzareli and Company perform it without drinking or smoking – what a novel idea. But seriously, who could do that as well as Sinatra. According to Pizzarelli, Sinatra could inhale the cigarette smoke and not exhale it until several lines later. We slide into Quiet Nights of Quiet Stars – a serenade of hopeful dreams that is the perfect counter point to the aforementioned melancholy. Michael Franks (Popsicle Toes) is next represented with a tribute to Jobim: Antonio’s Song. After this we digress – as this sort of gig can do so easily, to a description of the worst pizza in Brazil – it is served with ketchup and mustard – with a bit of audience participation as to where a person could get a good pizza in Brazil. Small world. A sweet samba by Pizzarelli – a tribute to Jô Soares of Brazilian television fame – lets Helio Alves take a stunning turn on the piano. Making it look easy of course. Another pairing with a nod to Kurt Elling who did it originally: If You Never Come To Me/Change Parners (Jobim and Oliveira/Berlin). Pizzarelli and Jobim’s voices blend so beautifully that you cannot always tell who is singing if you are not looking. 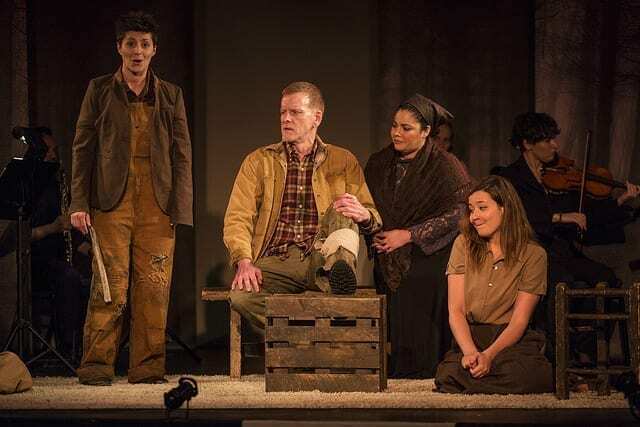 Their harmonies are sublime – and I would have liked a lot more of that element. And just as you figure that out, The Girl From Ipanema appears on the radar. Perfect timing. Slayed me again. Not for nothing, but it was about this time that Loston Harris, who is appearing in Bemelman’s Bar next door, popped in on a break just to listen. He did that twice. High praise when your peers seek you out. Next up are reminisces about the partnership of Sinatra and Jobim. When Sinatra first called Jobim’s home, decades ago, Jobim’s wife directed him to call the Ipanema bar. Which he did. Sinatra wanted to partner up, but he wanted Jobim to play the guitar. Jobim’s first instrument was the piano, so he took on the guitar to accommodate Sinatra. And history was made. The evening winds down with I Remember Sky (Sondheim), Waters of March (written on a brown paper bag) the combination of which makes the Pizzarelli household cry so you can imagine what it did to all of us. 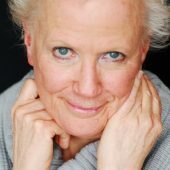 Moore stories follow, that are intimate, tender and hilarious. Pizarelli’s mini-college education (it was more a drive-thru). More audience chatter (Last year no one said a word, this year we are chatting away) And of course there are the stories of the Senior Bucky Pizzarelli who cannot keep a secret, nor should he be expected to. It’s right about this point that you realize you feel like you are a guest at a party that Pizzarelli has thrown. Because you are. A quick guitar lesson, specifically honoring the talents of Toninho Horta which are abysmally gargantuan. Followed by his Aquelas Coisas Todas (All Those “Crazy” Things). They close with Agua de Beber ( Jobim/Moraes), a melody so familiar that it underscores how Bossa Nova is present in our lives and has been for decades. Because of the language difference it is easy to overlook this vein of gold. Thanks to Pizzarelli and Jobim, we may all be knocked into rediscovering this treasure. Me first. The trouble with a night like this is that there is not one crappy thing to say about a-n-y-t-h-i-n-g. How many words can you find for fantastic entertainment. Made me laugh. Made me sing along. Made me weep. Made me happy to be in that exact seat at the bar on that exact evening. After awhile the brain goes numb with the struggle. Best to pull out the white flag and surrender. Get on over to this show, my chums. Pizzarelli and Jobim, Bossa Nova II, Café Carlyle – Performances will take place Tuesday – Friday at 8:45pm; and Saturdays at 8:45pm and 10:45pm. 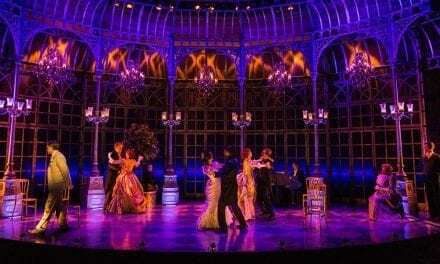 Reservations made by phone at 212.744.1600 are $100 ($150 for premium seating, $55 for bar seating) Tuesday – Thursday & the Saturday late show; and $110 ($160 for premium seating, $65 for bar seating) on Friday and Saturday. Reservations made online at www.ticketweb.com are $110 ($165 for premium seating) Tuesday – Thursday & the Saturday late show; and $120 ($175 for premium seating) on Friday and Saturday. Cafe Carlyle is located in The Carlyle, A Rosewood Hotel (35 East 76th Street, at Madison Avenue).